As an organization of alumni of De La Salle Philippines, Inc. (DLSPI) and affiliate institutions, the DLSAA confers awards that are different and distinct from those given by DLSU - M, DLSPI, or any other school of the De La Salle Brothers - Philippine District (DLSB - PD). This DLSAA Honors and Awards System intends to establish the policy, categories, awardee qualifications and criteria, procedures, and implementing guidelines for honors and awards. 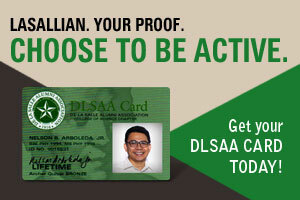 The DLSAA claims ownership of its awards and, accordingly, no award contained in this System may be given by any individual or organization without its expressed approval.